This would be one of my preferred salads to have at a barbecue, it goes so well with all barbecued meats. Store the dressing in the fridge for up to a week. Heat a non stick frying pan over a medium heat and fry the bacon until crisp. Transfer to a paper towel to absorb any excess grease, allow to cool before breaking into shards. Using a pestle and mortar, grind together the crushed garlic, salt and anchovies to make a thick paste. Transfer the paste to a jar then add the fresh lemon juice, Worcestershire sauce and olive oil. Season with some pepper and salt, shake until combined. Assemble the salad leaves on the plate then add the croutons. Boil the eggs for a few minutes until soft boiled approx 3 – 4 minutes depending on the egg size. 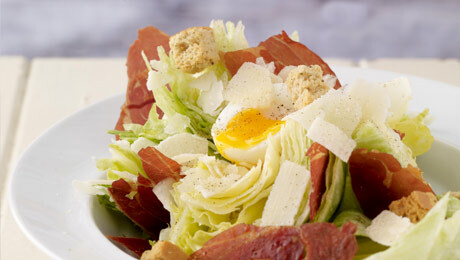 Remove the shell then cut into wedges, the yolk should ooze onto the lettuce. Sprinkle the bacon or prosciutto shards and parmesan shavings over the salad. Drizzle a little dressing over the lettuce and enjoy!